Addressing the exploding interest in bioengineering for healthcare applications, this book provides readers with detailed yet easy-to-understand guidance on biomedical device engineering. 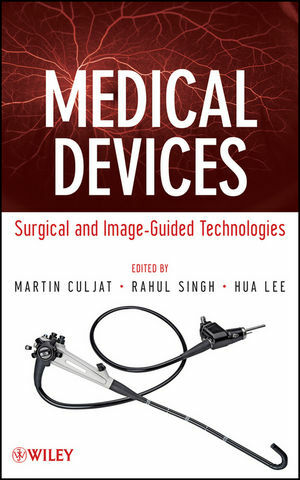 Written by prominent physicians and engineers, Medical Devices: Surgical and Image-Guided Technologies is organized into stand-alone chapters covering devices and systems in diagnostic, surgical, and implant procedures. An absolute must for biomedical engineers, Medical Devices: Surgical and Image-Guided Technologies is also an invaluable guide for students in all engineering majors and pre-med programs interested in exploring this fascinating field. MARTIN CULJAT, PhD, is Adjunct Assistant Professor in the UCLA Departments of Bioengineering and Surgery and the Engineering Research Director of the UCLA Center for Advanced Surgical and Interventional Technology (CASIT), a research center that promotes collaboration between medicine and engineering. RAHUL SINGH, PhD, is Adjunct Assistant Professor in the UCLA Departments of Bioengineering and Surgery. He leads several collaborative research projects at the UCLA Center for Advanced Surgical and Interventional Technology (CASIT). HUA LEE, PhD, is Professor in the Department of Electrical and Computer Engineering at UC Santa Barbara. Well known for his pioneering research laboratory, Dr. Lee is also the author of three other books on imaging technology and engineering.